Hey, future Aggies! I grew up in Albuquerque, New Mexico and moved to Las Cruces in 2012 to finish my Bachelor’s Degree in Communication Studies at NMSU and I’m currently in process of earning a Master’s Degree in Educational Leadership Administration. 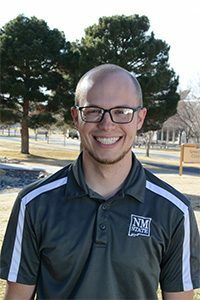 I have worked at NMSU since 2014 in the Financial Aid Office and working with students on applying to NMSU. During my time at NMSU, I spent playing ultimate frisbee, participating in intramurals, playing guitar in a band and getting involved in campus organizations. Now my wife and I enjoy checking out the Las Cruces Farmers Market, Aggie athletic events, and playing board games with our friends. My time at NMSU shaped who I am today in so many ways. My hope is that you can discover your potential as well!